The Phillies continued their Instructional League schedule on Tuesday by hosting the Yankees at Bright House Field. The game quickly got out of hand with the Yankees posting crooked numbers in the second, third, and fourth innings. The Phillies trailed 11-0 before getting their first hit in the bottom of the fourth inning. So, rather than go through this gore fest inning by inning, I’ll just cover the highlights and low lights. This is an instructional league. The coaches are introducing players to new/correct ways of doing things. So, if a player runs into a bad stretch, it is probably because he is trying to master some new skill. I apologize for the lack of pictures and video today. I wrenched my back and couldn’t get up and down the stairs as easily as on Monday. So, I concentrated on velocity for a while. Then I took advantage of my seat close to “a person of interest” to see if I could pick up some interesting tidbits. Kevin Gowdy got the start. 4 Daniel Brito went 1-3 with a BB and RBI. DH/7 David Martinelli went 1-3 with an HBP. 5 Josh Tobias went 1-4 with a 2B. DH/7 Gregg Pickett went 1-4 with a 2-run HR. 2 Rodolfo Duran went 0-1 with an HBP. Lartigue went 0-1 with a BB. 9 Jhailyn Ortiz went 1-4. 3 Luis Encarnacion went 0-4 with 3 K.
8 Juan Luis went 1-3. 6 Jonathan Guzman went 1-3. 7/DH Josh Stephen went 0-2. Two players joined the Instructs and pushed the roster total to 64 players. The new additions are LHP Oscar Marcelino and the PTBNL in the Carlos Ruiz trade, OF Joey Curletta. The updated roster also includes assigned numbers for Instructs. And now the highs, lows, observations, and other stuff. Kevin Gowdy looked sharp in a 1-2-3 first inning that featured 2 strike outs on off speed pitches (85 and 88 mph). His FB was 92-94 mph. He mixed his velocity well. The middle of the Yankees order squared up several balls in the second inning. He was getting ahead with fastballs, but seemed to be leaving pitches up in the zone. Daniel Brito made a web gem on a ground ball to his right, slid, back handed, spun, and threw out the runner. Alberto Tirado struck out his first two batters. An infield pop two-base error prolonged the inning and the Yankees scored 5 unearned runs. On the pop up, Guzman drifted into shallow and called for the ball. Josh Stephen who had collided with Guzman on an earlier catch, peeled off. The ball landed on the infield dirt behind second base as the runner jogged into second. Scored an error. I don’t know on whom. Adonis Medina was cruising with a couple of strike outs after an infield single when he gave up back to back home runs. 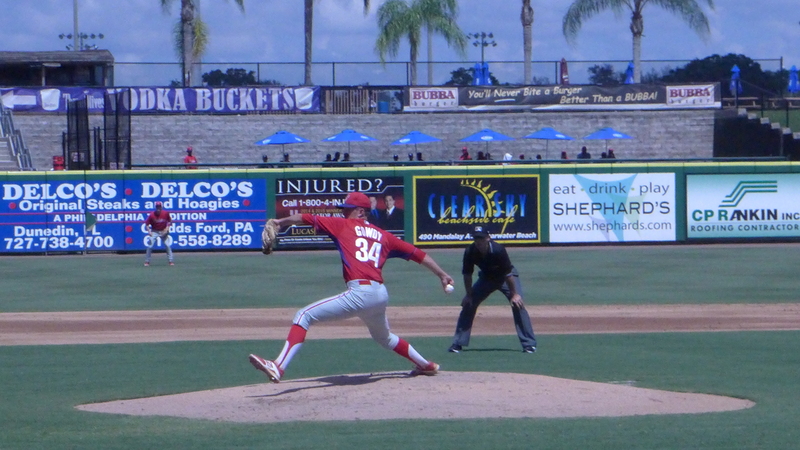 Sixto Sanchez struck out three in two innings. He would have had a fourth if the umpire didn’t miss a strike on a 2-2 pitch. The batter walked on the next pitch. Sanchez got two of his Ks looking at his off speed pitch, a slider I think. Falter was hit hard in his first inning, but retired the Yankees in ordeder in his second inning on a weak ground ball to second and two infield pop ups. Andrew Brown got 2 Ks on 81 mph pitches in a solid ninth. Greg Picket played the field in a game for the first time since XST. He was on the 60-day DL all summer. He took a step back on a fly ball in the ninth and couldn’t recover in time to make the catch. It’s also the first time I’ve seen him in left. I remember him playing right last year. Pickett looked good at the plate and finally had something to shoe for all his hard work with a blast to right. The two-run HR accounted for 2 of the Phillies 3 RBI. Daniel Brito had the other RBI on an infield single with the bases loaded in the eighth inning. The Phillies other two runs scored on a PB and WP. The final was 13-5. Caleb Eldridge, who disappeared during the GCL season, was sitting in the stands with his right arm in a half cast. An hour before the game, most of the pitchers were doing PFPs on Robin Roberts Field at the Carpenter Complex. Org meetings this weekend will determine which MiLB free agents they re-sign. Just like many of us, the Phillies anticipate losing some players during the Rule 5 draft again this year. Gowdy FB 92-94, off speed 86-88, and 83-84. Tirado FB 94-96, off speed 88 and 84. Falter FB 87-89, off speed 80-81 and CB 73-75. Brown FB 90-91, off speed 80-81 and CB 75. No readings on Sanchez and Medina. And some video of Gowdy. Sixto Sanchez is starting to look like a true jem!!!! He should have been out of the inning on the pop up that landed in the infield dirt for a two-base error. The next batter popped a ball down the RF line that fell in for a double. Ortiz had been shifted toward center for a right-handed batter and just missed catching the ball after a long run. As a long time Phillies fan, that ball landed in what we knew as “Utley territory”. I was a little miffed that the second baseman hadn’t moved at all toward the ball. He was also the closest player to the pop up that dropped in the infield. Anyway, the Yankees got a solid gapper and then two more hits before Tirado finally issued a walk. He threw a lot more pitches than he should have because of his defense. Just a hard luck outing, no big deal. Sixto. Sixto, Sixto. What more can be said? Encarnacion continues to go in the wrong direction. His Instructional League instructions: Try making contact once in a while. How about once a week? Was just noticing that Encarnacion is still….terrible. Exactly – he didn’t give up a run. He seemingly never gives up a run. Here’s to hoping that Sixto becomes to the Phillies what Carson Wentz is to the Eagles. Fly Sixto Fly! Love what we are seeing from Sixto. Stuff is excellent and comes with pitchability. On a side note seems like the “Beat Boys”, in this case it’s Gelb, are seeing what most of us have been talking about for two years. The recent concussion was sort of a freak thing; got hit in the head with a baseball on a pick-off attempt. Just unlucky. The fractured wrist, well, okay, that can happen too and one such injury doesn’t mean that Quinn is prone to broken bones. However, Quinn obviously IS prone to soft tissue injuries – the strained oblique (now re-aggravated), the strained quad, and the ruptured Achilles. It’s a real concern. Usually an occurrence in quite older folk, signifying signs of some sort of a mineral or vitamin deficiency, and fpr some cases, dehydration. Should not be the case in young, otherwise, healthy athlete. See both Gowdy’s on the video clips…Kevin and Trey. hopefully sixto and gowdy pan out because w are going to have our hands in the NL East shortly. Tim Tebow (aka Tim Griffey Jr.) hit a home run in his first professional at bat haha. Brito is a guy jumping up the list, along with Sixto of course. Encarnacion is at the other end unfortunately. I remember hearing about a GCL top 20 prospects list on here, but haven’t been on recently to see it. Did someone comment the list or something? I would really like to see it, like where Mickey Moniak and Sixto Sanchez are ranked, and if Jhaylen Ortiz made the cut! Or any other surprise names on the list, like Brito or Fanti, it seemed like they had very good years in the GCL. Jeff…look in this week’s Open Discussions…….about half-way down in the comments section…..poster ‘Tom B.’…has two posts…..the rankings and then later the write-ups. Games open to public? Free? Anyone have an update on Moniak? How about kurokawa? How’s he doing?